The conference will be held in English. Please send a title and abstract of your proposal (maximum 400 words) along with a short CV to the organizers of the conference: Birgit Mersman (birgit.mersmann@uni-due.de), Lena Bader (lbader@dfk-paris.org), Mona Schieren (m.schieren@hfk-bremen.de). The deadline for submissions is 31 December 2018. The selected presenters will be notified by 31 January 2019. Selected speakers can apply for travel funding (max. 250.- Euro). 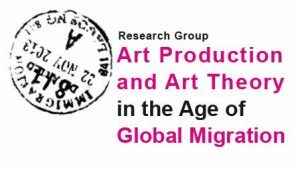 Migration in art and art history is primarily defined by the movement in both space and time of artists, curators, and critics, and their works, ideas, and memories (Mathur 2011). It has engendered geographically dispersed artistic communities bound by shared diasporic experiences and has generated splintered temporalities of artistic relationalities that negotiate between pastness, nowness, and futurity. The increasing diasporization of art and culture is a farreaching and profound shift resulting from global migration and its rapidly changing nature. As a global transnational process, migration has produced global diasporas (Cohen 1997), including ethnic, cultural, religious, and national diasporas, which fuel the dissemination of “diasporic imaginaries.” Beside the Jewish, Greek, Armenian, and Black diasporas — the most historically significant diasporic traditions — the Chinese, Indian, Iranian, Lebanese, Palestinian diasporas have, among others, become clearly visible on the world map of diaspora cartographies (Brah 1996, Dufoix 2008). To take account of these developments, diaspora research has undergone a process of reorientation over recent decades. Along with transcending the limiting classical notions of diaspora as anchored in the Jewish tradition, it has diversified in scope on every level, extended its definitions, and repositioned itself at the intersection of (trans)migration, transnational, and postcolonial studies. Postcolonial and anthropological theories of transversality, transculturation, and translation, as exemplified by Edouard Glissant’s Traité du Tout-monde (1993), Paul Gilroy’s Black Atlantic (1993) and James Clifford’s Routes: Travel and Translation in the Late Twentieth Century (1997), have contributed to rethinking the diaspora in terms of hybridity and redefining it as a concept, structure, and social practice of translational migratory culture oscillating between integrity and discontinuity (Quaysan/Daswani 2013). As a consequence of this shift, major diaspora research has moved away from the place-related analytical model that posits a diaspora as a place (of origin) and the hoped-for return to it. Instead of a strictly spatial separation between homeland and host country, it has foregrounded the analytical concept of the “diasporic imaginary” as a space of imagination which “account[s] for the creation of the diaspora […] through formations of temporality, affect, and corporeality” (Axel 2002, 412). Reconsidering diasporic communities as “imagined communities” (Anderson 1991) established the notion of the “diasporic imaginary” (Mishra 1996), making it possible to reinterpret the imaginary as the creation of a shared diasporic space of dreams, fantasies, and visions. Most powerfully — and often even violently — the “diasporic imaginary” emerges at the intersection of global transnationalization and (re-) nationalization. For this reason, it is interconnected with and nourished by both the “global imaginary” (Steger 2008) as a consciousness of belonging to a global community and the “national imaginary” as a construction of shared ideas and ideologies within a nation. How does redefining the diaspora as an imaginary at the interface of cosmopolitan detachment and deterritorialized nationalism affect the analysis of art history, art theory, and art practice? How are biographies of migration and displacement, trauma and fantasy, re-narrated in artistic and art historical discourses? Are multiple senses of belonging creating productive ambiguities of multilayered meaning? Or are they producing conflicting perceptions and fractured perspectives? How are individual subjectivities of diasporicity reflected in art production? Do diasporic imaginaries generate specific forms of art practices and epistemological images of thought like the rhizome? In what ways does the concept of the diaspora as a network of transnational connections allow us to transcend the frame of the mobile individual subject and address complex formations of community and network-building that even include nonhuman actors and ecologies? To what extent do digital technologies that facilitate imaginary migrations in both space and time contribute to producing multiple belongings? Quayson, Ato, and Girish Daswani. “Introduction – Diaspora and Transnationalism. Scapes, Scales, and Scopes.” A Companion to Diaspora and Transnationalism, edited by A. Quayson and G. Daswani. Oxford: Blackwell, 2013. Steger, Manfred. The Rise of the Global Imaginary: Political Ideologies from the French Revolution to the Global War on Terror. Oxford: Oxford University Press, 2008.